LVT Before You Buy | Classic Carpets Inc. These floors should not be used in high moisture areas. Typically, these floors should not be installed over existing resilient floors. When using radiant heat flooring, the substrate should not exceed 85°F. 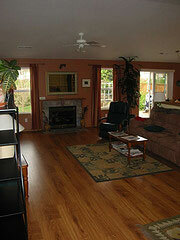 If not installed properly, the floors can look unsightly and not wear properly. These floors can scratch and indentations can be made. It is recommended that these floors not be exposed to too much sunlight. Drapes and window coverings are recommended during peak sunlight hours. Hot items like cigarettes and matches can burn the floors.